This cream of peanut soup is a Southern classic. We’ve also provided a spicy African peanut soup as another perspective. Photo courtesy King’s Arm Tavern. 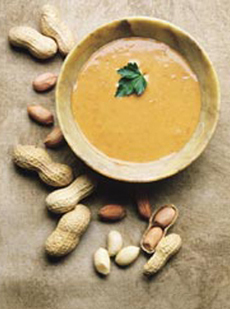 Peanut soup was popular in Colonial days, and can still be found on some Southern menus. If you visit Colonial Williamsburg, you can order it at the King’s Arms Tavern (where they also make their Cream of Peanut Soup with peanut butter) and other on-site restaurants. It’s delicious. In Africa, peanuts are called pinder and goober, words that crossed the Atlantic. Both Thomas Jefferson and George Washington called peanuts “peendar” and “pindars.” Southern Colonials planted peanuts as fodder for pigs, and their slaves used the peanut to make peanut pie and peanut soup. The word goober came into fashion in the 19th century, and the Civil War song “Eating Goober Peas” was published attributed to the composer and lyricist, A. Pindar and P. Nutt. Want to try more Colonial recipes? 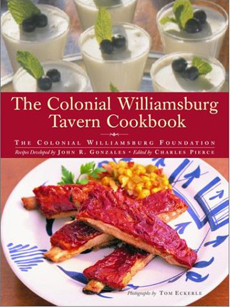 Pick up the Colonial Williamsburg Tavern Cookbook. Cook up a Colonial storm with this cookbook . Pour in the chicken stock, increase the heat to high, and bring to a boil, stirring constantly. Reduce the heat to medium and cook, stirring often, until slightly reduced and thickened, about 15 minutes. Pour into a sieve set over a large bowl and strain, pushing hard on the solids to extract as much flavor as possible. Return the liquid to the sauce pan or pot.